It’s unexpectedly quiet in the Silver Corners Inc., sow barn owned by Dennis and Tara Terpstra. There’s some grunting and a few clangs from the electronic sow feeders (ESF) but no sounds of fighting or agitation. Mostly, it’s the sound of jangling chains one hears as you enter the bright, clean, loose-housing barn the couple built in 2015 to exceed current pig housing standards. 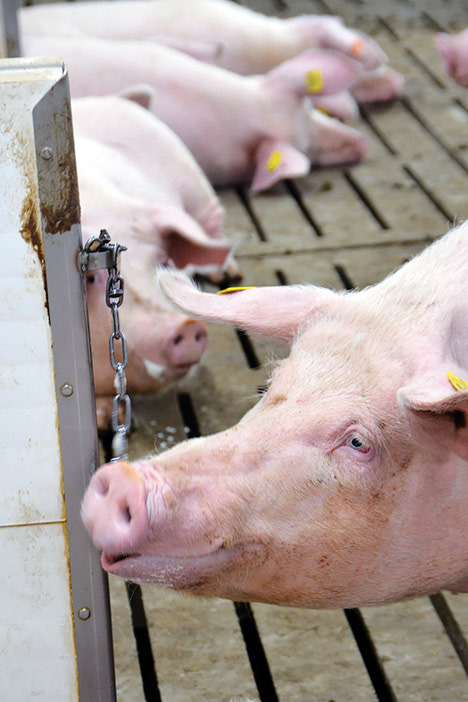 Simple lengths of chain hang from the ends of each partition wall as part of their use of enrichment devices to eliminate aggression, meet Code of Practice protocols and create an environment that pigs from weaners to adult sows, can thrive in. 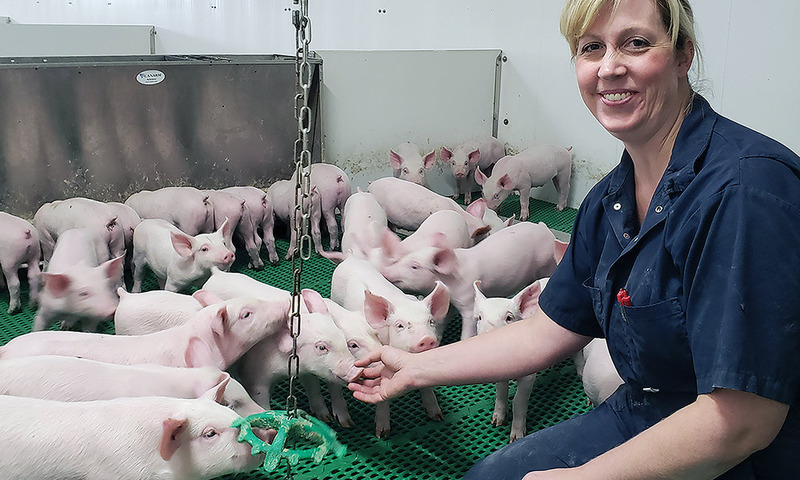 Focusing on antibiotic-free pork, with a contract meeting Loblaw’s specifications, the couple makes broad use of enrichment devices as part of their pig-raising and marketing strategy. 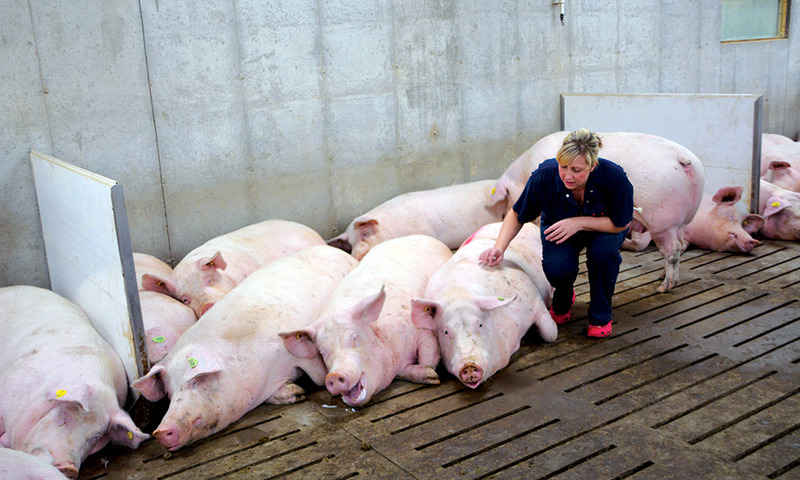 When they first started into pigs, Tara and Dennis were in a partnership and focused on the finishing end. Being a city girl, Tara didn’t spend much time in the barn as she raised the couple’s three sons. When the partnership dissolved, and Tara was looking for work, she posed the idea that she might like to work in the barn with the pigs. She already had an abiding affection for these intelligent creatures. When the national pig code of practice required all barns with gestation housing to be converted by 2024 and any new builds requiring group sow housing, Tara and Dennis found a system they were both excited about. They decided to build a brand-new sow barn and nursery with the latest technology for feeding, ventilation and animal care. It can house over 350 sows and the resulting facility is bright, airy and far less odorous than older pig barns. The new structure requires different management techniques as pigs “are really only happy when they are wrecking something,” laughs Tara. 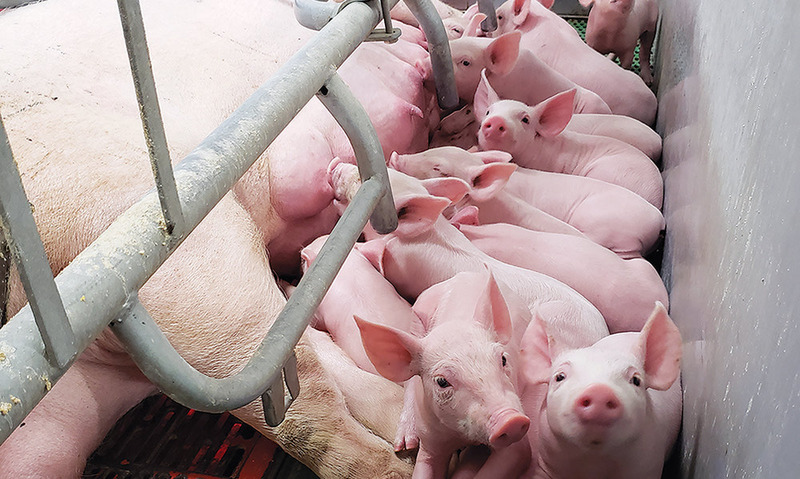 Consequently, there was a huge learning curve as it is estimated only 15 per cent of Canadian hog farmers have switched to loose housing. The reality is sows bite and fight and strategies are required to reduce poor behaviours. Understanding sows have a pecking order, the Terpstras built a two-sided sow barn so that they could monitor two dynamic groups of sows. There is also a training pen in the back where new gilts are kept and trained together. 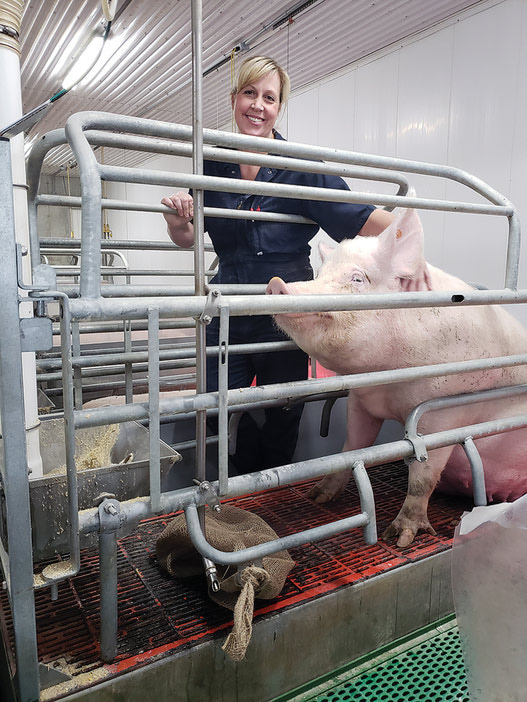 “We’ve trained more than 450 sows in the last two and half years,” says Tara, explaining that the ESF is new to pigs who grew up eating from a trough. With ESF, the gilts and sows enter a gate to access their feed ration, portioned to their requirements as dictated by their electronic tag. Food finished, the sow has to push through another gate to leave the system. Once they understand it, the system works brilliantly even with some scuffling at the entry and departure areas. Pigs can be bullies and sometimes a sow likes to wait with sour intentions for sows coming out. “Some gilts get it in a day. Others need five to six days of training,” says Tara. The process requires a lot of patience. “If you make one mistake with a pig, it’s three mistakes for us.” All this early handling helps the sows get used to people and we walk through the sows, the friendly ones eager to lick my camera and rub against our legs. 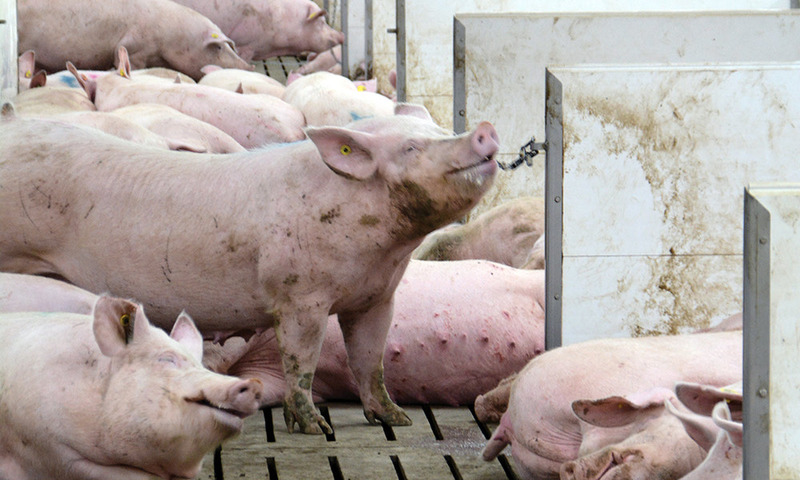 Part of sow-raising protocol requires all farmers to provide two forms of enrichment. Terpstras provide three and are looking to add a fourth. Sows can be seen playing with the three devices: the already-mentioned chains, a no-name plastic toy (a plastic disc with plastic arms) hanging from the ceiling and a blue rubber spiky ball from Ireland called Easy Fix Luna. Tara plans to install speakers and play music for the sows. Also in consideration is a scratching pole which she learned about from another producer. “But the bristles were too rough,” says Tara. Lengths of wood are another option. The pigs love it but wood’s tendency to splinter makes Tara nervous. Plus, she prefers toys that can be easily cleaned and sanitized as per strict cleanliness and biosecurity rules in place at Silver Corners. In some European countries, tail-docking is banned. These farms are also required to use enrichment devices that are 50 per cent natural (wood, straw, etc). Pigs love straw but the Terpstra’s manure handling system makes use of straw and hay difficult to manage. Given the sows’ fascination with the chains (they literally wait in line to use them) Tara’s sows seem quite pleased with their current enrichment devices. Fighting and tail biting is reduced and the pigs are calmer. Once bred and ready to give birth, the sows move into farrowing rooms where the expectant mothers are given a length of burlap to chew on. This encourages their natural nesting behaviour. “We get 100-foot rolls from the feed mill,” says Tara. “They chew it, eat it, rip it or use it like a ‘dookie’ ” explains Tara. She believes the burlap has reduced sow anxiety and it’s rare she has to inject a sow with Stresnil to them down during farrowing. 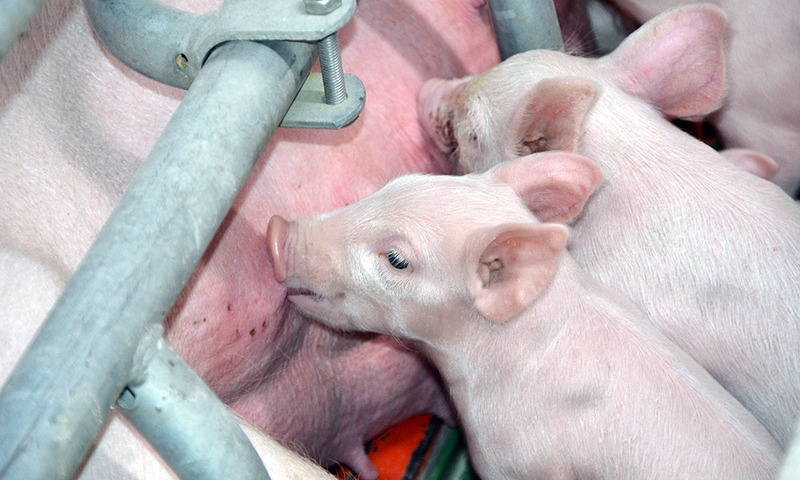 Once born, the piglets feast when not exploring or sleeping on their heated mats. Sometimes they can be found curled up in the burlap. “It smells like mom,” says Tara. 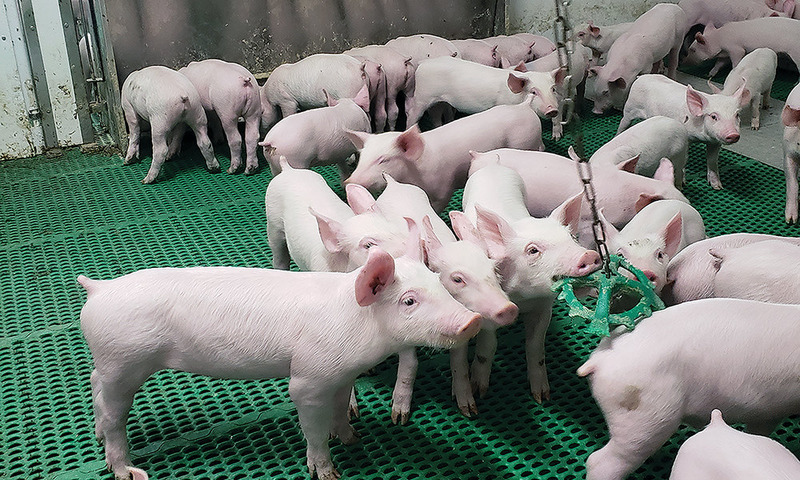 Having just returned from EuroTier, a large agricultural exhibition in Europe, Tara came home with the idea to install boating rope in the pens for the piglets to chew on. She’s still figuring out the best method to install this new enrichment device. From here, the piglets are moved into the cold nursery and finally, the finishing barn with toys all along the way. Dangling chains bolted to the pen corners seem to work best in the finishing barn. Some pens have big yellow balls as well. Tara has had devices dangling from the ceiling but pigs are well-known for their destructive ways and she’s already had one device torn from the ceiling, requiring repair. Tara’s nurturing tendencies are clearly evident. Having grown up in the city, she isn’t thwarted by “this-is-the-way-we’ve-always-done- it” thinking. So offering enrichment devices to keep pigs happy seems so obvious, she doesn’t understand why she gets “looks” when she goes to meetings to extol the virtues of enrichment devices. The couple’s barn manager, Ryan Leibold of Wingham, agrees. 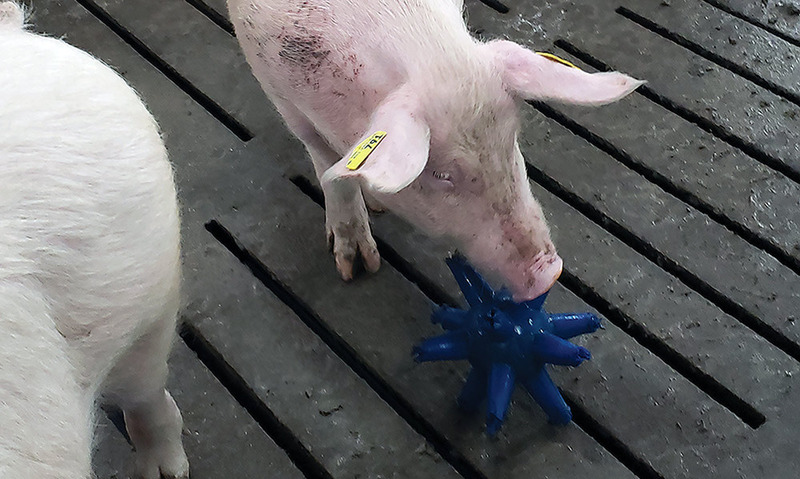 Having worked in other pig barns, he sees the difference enrichment devices make for his work environment. It’s the kind of barn more people should get a chance to see but in the pig world, biosecurity is critical. Entrants have to remove clothing, shower and dress in farm-supplied clothing before entering the barn.